This month’s meeting was “All About Bindings." Five of our members led small demos on various topics related to finishing off your quilt with various binding methods: Rebecca Cynamon-Murphy, Sara Hochhauser, Heather Kinion, Dani Miller, and Carole Wool. Rebecca Cynamon-Murphy shared with us a method for making continuous bias binding. The method she showed us begins with a rectangle piece of fabric (most techniques have you begin with a square of fabric) and all you need to sew just two seams together. During her demo she had members practicing using a piece of paper and masking tape. For information on the technique Rebecca shared refer to her handout: Continuous Bias Binding.pdf. Sara Hochhauser shared with us a technique for facing a quilt. This finish gives the edges of a quilt a clean look without the frame of traditional quilt binding. This technique starts with cutting four squares of fabric and folding / pressing on the diagonal creating a triangle. Place a triangle in each corner (on the front with the raw edges matching the sides of the quilt) and stitch in place with a ¼” seam. Place the binding strips on each side of the quilt leaving space on each end. This will reduce bulk in the corner and the triangle will cover the raw ends of the binding strips. Turn the binding to the back of the quilt and hand sew in place. Sara referred to Member Robbi Joy Eklow’s tutorial on How To Make A Quilt Facing. Refer to that blog post for more detailed instructions. Heather Kinion shared with us a technique for perfect mitered corners. She begins by placing a pin on the top of the quilt at ¼” from the edge of the first corner. The binding strip is placed on the front of the quilt and is stitched down ¼” fro the side of the quilt. When Heather reaches the pin she stops. At this point you have a couple of options: 1. Lift your presser foot and turn your quilt 45 degrees. Lower the presser foot and sew a 45 degree angle right into the corner and off the quilt, or 2. backstitch. The latest issue of Modern Patchwork March/April 2018 has a great article. There may also be a similar tutorial in an old issue of Love of Quilting or Quilty. Dani Miller shared with us some techniques to finish off your binding by hand. Dani begins by threading her needle and tying a knot at the bottom. She prefers to use a double strand of thread. Start somewhere on a side and turn the binding to the back being sure to cover the machine stitching. Begin by hiding the knot under the binding and pulling the thread so it’s perpendicular to the edge of the quilt. Using an applique stitch (aka blind stitch), the needle will come up through the quilt back (and batting) and then you will take a small stitch at the edge of the folded binding and return to tunnel through the quilt for one stitch length. Ideally you would want to catch only 2-3 threads with each "bite" of the binding and to take the stitch slightly under the edge of the binding fold. Stitches are placed about 1/8”–1/4” apart. Carole Wool shared with us a technique for making a machine binding with a flange. You will need two fabrics, one as the primary binding fabric and the other as the flange (or accent). Cut the primary binding fabric 1.5” wide and the flange 1 ¾” wide (the length will depend on how much you need for your quilt). Right sides together, sew the strips together lengthwise with a ¼” seam. Press the seam towards the primary fabric. Fold lengthwise with wrong sides together and press. Attach the binding to the BACK side of the quilt. Fold the binding to the front and secure (with pins or wonder clips). From the front of the quilt, stitch in the ditch along the flange to secure. THANK YOU Carole for the samples you provided. It will make things easier for us when we try this technique at home. Our mini quilt swap concluded at this meeting with a SPECTACULAR display of quilty goodness. Oh my, those minis were beautiful! This event was led by Member Emily Lang and she did an outstanding job in organizing and pairing members perfectly. THANKS Emily for all your hard work you made some members very happy today. Kathy DeVries and Melissa Bogusch, two of the swappers. A BIG THANK YOU to outgoing Board members Amy Struckmeyer (President), Dani Miller (Treasurer), and Dianne Bienick (Secretary) for your dedicated service! We hope you are enjoying our monthly newsletter, “The Full Bobbin." If you are in a quilt show or magazine, have a teaching gig, or are hosting an event we want to know about it. Please make sure to contact Social Media and Communications Chairperson Jenni Grover so it can be included. Also, contact Jenni if are a new member and you have yet received an issue. Membership Chairperson Rebecca Cynamon-Murphy has membership cards for 2018. If you haven’t received yours yet please see Rebecca at a guild meeting. 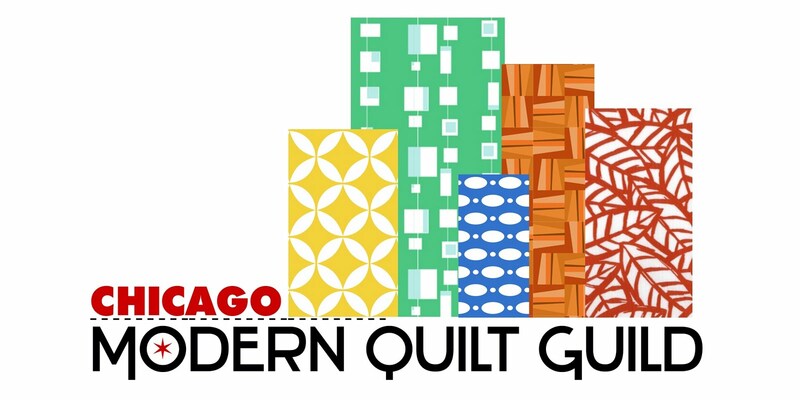 Sign-ups have closed for the mini swap with the Ann Arbor Modern Quilt Guild. If you have not received an email assigning your partner, contact the board. International Quilt Festival (IQF) will be held April 12-14 at the Donald E. Stephens Convention Center in Rosemont, IL. On April 21, we will be hosting Tara Curtis (@weftyneedle) for a workshop on fabric weaving. Registration for the workshop is open and there is still one spot remaining. Registration is now open to non-members. For more info including registration click here. Our April 22 meeting will be a lecture by Tara Curtis. More info to come. Our May 20 meeting will be “All about Design: Texture." This will include information on trapunto, alternative fabrics, hand stitching, 3D manipulation, and so much more. Our June 17 meeting will be a sew-in at the Arlington Heights Memorial Library. It will be an atypical time, so mark your calendars:12-6pm. On July 14 and 15, we will be hosting Lynn Carson Harris for a workshop and lecture. The workshop will be “Tiny Piecing’ and her lecture will be a trunk show. On October 20 and 21, we will be hosting Season Evans for a workshop and lecture. The workshop will be “Minimalist Improvisation” and her lecture will be “Minimal Quilts – from Traditional to Modern." On May 10 and 11, 2019, we will be hosting Libs Elliott for a workshop and lecture. Special Events Chairperson Laura McDowell Hopper is looking for locations to host guild workshops and sew-ins. She is looking for a space that can accommodate 24 people with ample electrical outlets for their sewing machines and to set-up several ironing stations throughout the room. Must also be reasonably priced. If you know of any place in your area or if you have any questions, please contact Laura. The guild’s QuiltCon Charity Quilt was on display in Pasadena last month and it was BEAUTIFUL. After the convention the quilt was donated to the Las Vegas Modern Quilt Guild for their #quiltsforvegas project. 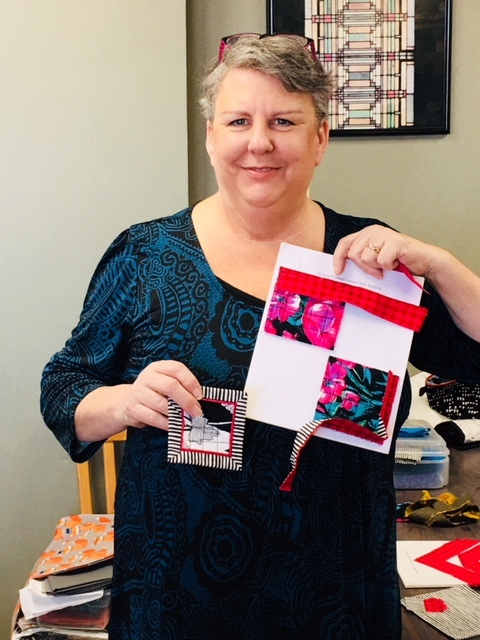 Members have been making string blocks and member Debbie Pine has been hard at work turning them into quilts. She has the first one completed. Isn’t it totally adorable?! Several members offered to piece tops and another took one home to quilt and bind. Debbie said she will continue as long as members are willing to make the blocks. So if you have any at home, get them done and bring to a guild meeting. Debbie also mentioned that she will look into getting more foundation paper squares. GREAT JOB Debbie!!! Member Sarah Shulman has been equally busy with the The Road Home Program quilts. She completed a third quilt top and shared it with us during Show & Tell. Isn’t it BEAUTIFUL?! Member Deb Pentek has offered to quilt and bind this quilt. To date, Sarah has two completed quilts and will be giving them to The Road Home Program shortly. Keep up the good work Sarah, you're doing an AMAZING job!! !